The Mills Of God Grind Slowly… | Be Responsible – Be Free! …but they grind exceedingly small. The Heydon Royal Commission into trade union governance and corruption, which opened proceedings in Sydney in April this year and is due to report to the Governor-General by 31st December, has heard testimony from an impressive number of witnesses in the time available to it. But as the hearings have dragged on, week in and week out, the names on the daily witness list have been getting bigger and bigger. And now, we’re at the pointy end. Tomorrow’s schedule, Wednesday 10th September, has been cleared to take testimony from just one witness. In 1991, the Melbourne-based industrial law firm Slater and Gordon was handling the legal affairs of the Australian Workers’ Union, among others. A senior partner in the law firm, a 31-year-old woman with a already-long history of involvement in undergraduate and Communist political movements, was tasked to handle the AWU account directly. This woman reported directly to another senior Slater and Gordon partner, a man named Bernard Murphy—who just happens to have spent much of today in the witness box of the Royal Commission. 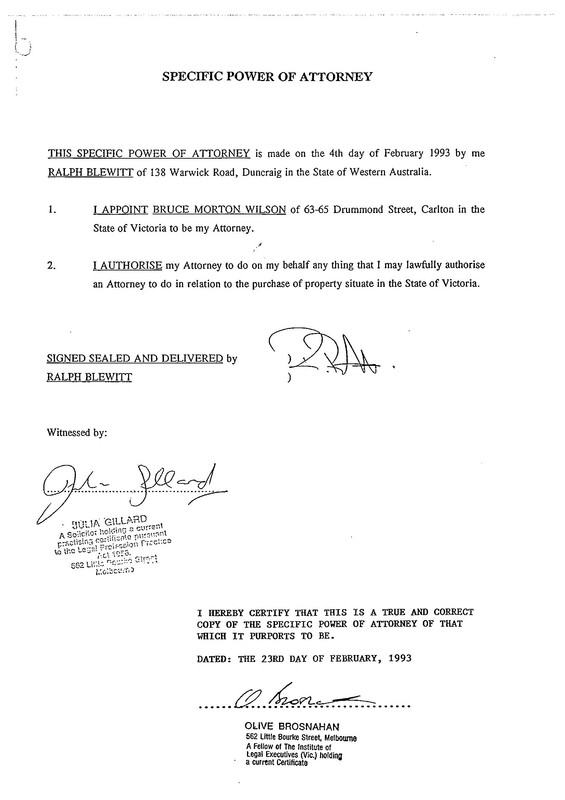 Slater and Gordon’s principal AWU contact was the Victorian State Secretary, one Bruce Morton Wilson. Though Wilson was at the time married and with children, he became involved in an affair with this woman. She did not, as was her professional and ethical duty, either recuse herself from the AWU account, nor did she inform either her employer or her client. The affair remained a secret for over a year. Soon afterwards, Wilson asked this woman, in her professional capacity, to establish in Western Australia, a legal device known as an “incorporated association”. This is most commonly used for non-profit organisations such as sporting and social clubs, enabling them to set up a bank account and handle monies according to a constitution, or “rules of association”, without attracting tax liability. The name of the association should reflect the entity it represents, such as “The Springwood Junior Football Club”. Its establishment details, such as postal address, should also reflect that entity. But Wilson had asked for his association to be named “the Australian Workers’ Union Workplace Reform Association”. This gave the clear impression that the association was part of the AWU. Inexplicably though, Wilson and his sidekick, a man named Ralph Blewitt, were the only nominated officers of the association. Wilson was the only AWU officer signatory to the bank account. And the registered address was not that of the AWU Melbourne headquarters, but a post office box in suburban Perth, thousands of kilometres away. Wilson’s attorney, this thirty-something senior law partner, claims to have had no suspicions that anything was amiss in any of this! But (it now appears), to make sure no one else became suspicious either, she kept the fact of her setting up this association a secret, both from her employer and from the AWU—just as she had done with her clandestine affair with Wilson. She did not open an account for this work, or bill the AWU for it, or even record it on Slater and Gordon’s filing system. To an outside investigator, it never happened. With everything now in place, Wilson went to work, flying out to Western Australia—ostensibly on official AWU business. He proceeded to extort large sums of money—tens of thousands of dollars at a time—from some of that state’s largest construction firms, in exchange for guarantees of worksite industrial peace. The construction firms paid through the convenient fiction of invoices for “workplace safety training” that never actually occurred. Not that the construction companies cared—they were getting what they paid for. All invoices were payable, not to the AWU, but to the AWU Workplace Reform Association—the entity that no-one in either the AWU nor Slater and Gordon knew about, outside of Blewitt, Wilson and his lover. The entity whose bank account was in Wilson’s sole control. When the balance in this account reached a substantial six-figure sum, Wilson decided to buy himself a house in suburban Melbourne. So as not to attract attention, the house was bought at auction in Blewitt’s name. And this is where Wilson’s lover made her fatal mistake. She claims to have properly witnessed, in Slater and Gordon’s Melbourne offices, a power of attorney granted to Wilson by his yes-man Blewitt to enact this swindle—excuse me, transaction—signed and dated by all parties. The penalty for fabricating such an important document (creating a false instrument, as I believe it is known in the criminal statute books) is a lengthy term of imprisonment. Documentary evidence proves conclusively that Blewitt was in Perth on the day in question, and can not have signed it. Blewitt has now given sworn testimony to the Royal Commission, under penalty of perjury, that he did not sign it. There still was not enough money in the AWU-WRA account to cover the sale price, so Wilson arranged for his girlfriend to obtain a temporary loan from S&G to cover the balance. At the rate money was flying in, it would doubtless be paid back in short order. So much so that, when shortly afterwards the girlfriend took off for a brief holiday, according to independent Commission testimony of a builder and a union official, Wilson took the liberty of using the same funds to conduct renovations on her own home. How do you think Commissioner Heydon—a universally-respected former High Court justice with a lifetime’s experience in civil, commercial and criminal law—will view all of this history? There is more—much, much more—and I have not even made reference here to criminals even higher up in the union movement, who are yet to appear before the Commission. Many others have described this history far more fully and eloquently than I have. And in fact, those journalists and union officials who have worked tirelessly for justice in this matter for so many years, will tomorrow be sitting in the hearing room, or watching live streaming over the internet, with some very satisfied smiles on their faces. But this senior law partner, this young and naïve woman as she characterised herself last year, is about to face the day she told herself all along would never come. Her almost unbelievable account of these events, and her rôle in them, is finally to be scrutinized, not from a stage-managed press conference, but under relentless cross-examination by some of the nation’s top silks. Let’s see how those stories stand up then. “Retribution” indeed. I await the outcome with interest. How’s she going to get out of this then? Perhaps a beagle ate all her documents . . . ? And even now, I just the other day heard someone say “I want Julia back!” Why does everyone get a vote in our electoral system? For those interested, here is the house in question: 85 Kerr Street, Fitzroy, just 10 minutes’ walk or a short tram ride from Melbourne’s CBD. Similar houses in the suburb are now fetching upwards of a million bucks, so not a bad investment. More on this story throughout the day as it breaks. Live streaming of the Commission’s hearings is here. Explosive stuff. UPDATE: I can see former AWU Vice-President Bob Kernohan sitting in the gallery. Kernohan has been pursuing the recovery of his members’ money for nearly twenty years now. In the course of those years he was offered a safe Labor seat in parliament in exchange for dropping the matter (an offer he rejected), was brutally bashed by union thugs, had his union career destroyed and subsequently battled alcoholism and depression. Today has been a long time coming for Kernohan, but final justice will not come for him until the cell door clangs shut on the perpetrators. Today isn’t a bad start, though. 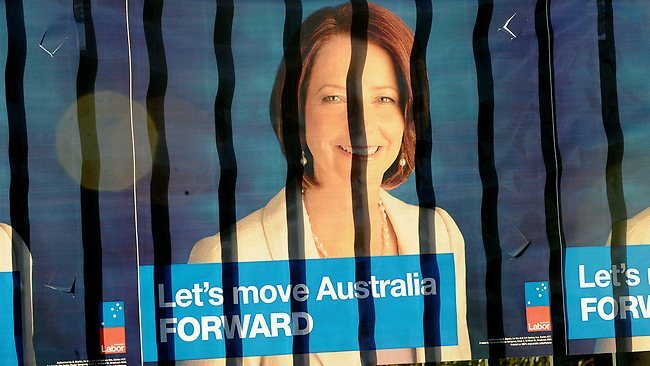 UPDATE Gillard has been sworn in. What a lot of “I don’t recall”. Michael Smith was in the room. Here is his take on Gillard’s testimony. Well the consensus this morning is that Gillard got off quite lightly during yesterday’s testimony. There were any number of questions Jeremy Stoljar QC, counsel assisting the Commission, could have asked but didn’t – about the applicaton (and re-application, after it was rejected first time around) to register the AWU-WRA, about what Gillard knew and when, and about how she benefited from the proceeds of the AWU-WRA bank account. While the ABC and Fairfax press today remain typically fawning, speculation this morning is that Stoljar may have agreed beforehand to pull his punches, in deference to an ongoing Victoria Police Fraud Squad investigation into this matter, which I suspect may wind up a day or two after Commissioner Heydon hands down his report on 31 December. The bigger union crime is the next piece of the puzzle, and revolves around why the AWU executive never pursued Wilson for the return of its members’ money after his fraud was uncovered. But that’s a story for another day. Grace Collier in today’s Weekend Australian on the true significance of Gillard’s appearance at the Royal Commission. If that link blocks you, Andrew Bolt’s summary is here.